It’s ugly, and some of the boards I used were a bit twisted so there’s a few gaps, but it’s solid, heavy and was cheap to build. I wanted something easy and simple to build from the scrap 2×4’s and an old 2×12 shelf that’s been in the garage for 10 years or more. After finding the Easy Shop Table, I figured that’s the one for me. I had all the 2x scraps for the frame, some mdf scraps for the shelves, and an old router table top to be used as the planer platform (3/4” baltic birch plywood). The only out of pocket cost will be the casters (not added yet). I printed out the plans by Lockwatcher so I could figure out what changes needed to be made to the pieces to fit my shop and planer. Overall dimensions are 24” long x 24” wide x 32” tall with the casters. It’s the perfect size. I added a middle shelf so there’s two inner leg pieces instead of one. I added a middle brace to give the top more support. It was a pretty simple project other than working with the defects of the old scraps. It was completed in an afternoon and was assembled with glue and mcfeely’s screws. If I were to build another one I’d do as the plans suggest and get a couple of nice 2×10’s. It’s a very solid design, and I may go ahead and build the torsion box assembly table as in the wood magazine plans where Lockwatcher got the idea for his table. I have that same planer. I love it. Nice table. I need to build one of these too. I have a temporary set up right now. 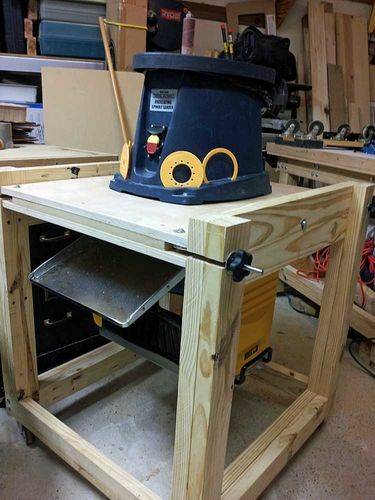 These little shop tables look easy to make. I’ll have to tackle one soon. Thanks for the inspiration. everything that goes in comes out very smooth. I’m glad I didn’t splurge on the more expensive dw735. It was really easy to build. If you follow Ken’s plans and buy the 2×10’s new you’ll probably have an easier time than I did. Good job. You are going to love that mobile stand. Mine is similar, but flips. Plan is from “The Complete Small Shop” magazine that I got with my subscription to ShopNotes. Only difference is I used 2 x lumber recycled from my old work bench, cut to 3 inches wide. Legs are glued and screwed together. I added a lower shelf later but don’t have a picture of it. Note: I just finished planing some boards, rolled the stand out of the way and rolled the jointer out so I can smooth an edge. Very convenient to be mobile. I’ll probably build a flip top version when I get the ridgid oss later on. 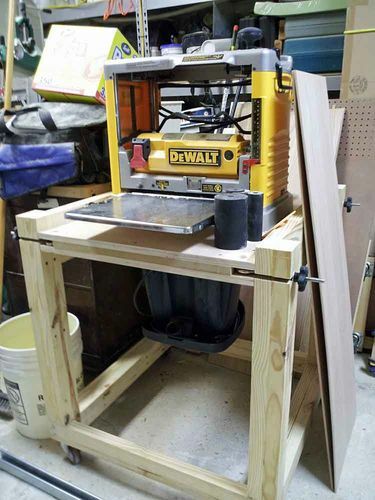 I built something similar and found that the shelves (and in my case drawers) collected a lot of sawdust. -- When questioned about using glue on a garbage bin I responded, "Wood working is about good technique and lots of glue........I have the glue part down."